Overcoming adversity is a common theme found in most metal, but it's never hit as close to the bone as it has for the members of Misery Signals. Enduring a fatal van accident, which claimed the lives of two of the vocalist's ex-band Compromise, would be enough for most people to turn tail and run. Instead, the resilient singer joined forces with members of the wavering outfit 7 Angels and 7 Plagues and created this metallic juggernaut. The result is an impassioned 12-track endeavor that merges the savagery of underground metal with the aesthetics of the heavier side of the screamo movement. Such moments of brutal grace can be found on the dynamic and poignant track about the tragedy, "The Year Summer Ended in June". Armed with the best of intentions and the power of healing fully in tow, along with metal producer extraordinaire Devin Townsend at the helm, a new beginning from the unfortunate endings looks and sounds to be something to rejoice over for metal fans and the band alike. 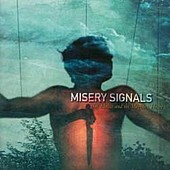 Misery Signals exquisitely display the wide range of emotions that coincide with its experiences, and have made an album that will grab you by both the throat and the heart at the same time.